This book gathers together several essays by historians of economics who express varying reactions to the Peart-Levy thesis. Laurence S. Moss is the editor of the American Journal of Economics and Sociology. He advocates the cross-fertilization of ideas in both economics and sociology by the choice of topics included in the journal as well as the methodologies employed. He was born in New York City and now lives in Brookline, Massachusetts. He is a Full Professor of Economics at Babson College in Wellesley, Massachusetts. Observations on The "Vanity of the Philosopher" (Charles R. McCann, Jr). The "Vanity of the Philosopher": Analytical Egalitarianism, Associationist Psychology, and Eugenic Remaking? (Andrew Farrant). In the Shadows of Vanity: Religion and the Debate Over Hierarchy (J. Daniel Hammond). The Vanity of the Economist: A Comment on Peart and Levy’sThe "Vanity of the Philosopher" (Kevin D. Hoover). Classical Equality: On the Content of Analytical Egalitarianism (Joseph Persky). 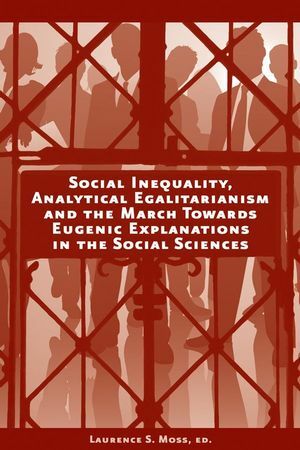 Thinking About Analytical Egalitarianism (David M. Levy and Sandra J. Peart). Social Anthropology in Economic Literature at the End of the 19th Century: Eugenic and Racial Explanations of Inequality (Terenzio Maccabelli). Contains several essays by historians of economics who express varying reactions to the thesis expressed in Professors Sandra J. Peart’s and David M. Levy’s book The ‘Vanity of the Philosopher’ : From Equality to Hierarchy in Post-classical Economics. Explains the importance of “analytic egalitarianism” in economics and the sad consequences of moving away from this approach. Provides reading that can complement reading lists in economics, the mathematics of gambling and the political economy of the gaming industry.